The Pirate Bay was launched in 2003 and has established itself as the world's most high-profile file-sharing site. But its founders are now on trial for copyright violation and face imprisonment, if found guilty. The Pirate Bay team aren't shy about what they are doing - they are pirates, and proud of it. Their logo shows a galleon under full sail, with a cassette tape topping a skull and crossbones in a nod to the Jolly Roger. It is an accurate characterisation, according to Swedish prosecutors, who have put three of the website's creators and one of its sponsors on trial on charges of contributing to copyright infringement. But the defendants claim to be more Robin Hood than Blackbeard, freeing creative content from the shackles of copyright. "There is not a cause closer to my heart," one of the founders told Wired. "This is my crusade." 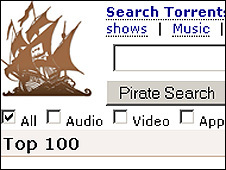 The Pirate Bay website hosts BitTorrent tracker files, and claims to be the world's largest: in February 2009, it reported 22 million simultaneous users. BitTorrent connects people so that they can share files over the internet. But users need a "tracker" link to find what they're looking for - like the index card in a library catalogue. The Pirate Bay provides a directory of these trackers, essentially becoming a library of catalogues. It doesn't store the books, or files, itself, just the information on where to find them. This distinction is what Pirate Bay claims will protect them under Swedish law. "The tracker provides the user only with .torrent files which contain no copyrighted data. The actual copyrighted material is to be found on the individual machines of our users, not on our servers," says the site. The Pirate Bay's enormous success has enraged copyright protection groups like the Motion Picture Association of America (MPAA). And the site's cheeky bravado rubs salt in the wounds. For example, it posts all of the cease-and-desist letters that it receives, including its sarcastic replies. "Please don't sue us right now, our lawyer is passed out in an alley," says a reply to videogame giant Electronic Arts. The site was founded by the Swedish file-sharing advocacy group Piratbyran ("The Piracy Bureau") in 2003, but has been run independently since 2004. As other file-sharing websites were felled by threats and lawsuits from industry heavyweights like the Recording Industry Association of America (RIAA), the Pirate Bay held its ground. Confident that Sweden's lax copyright laws meant that they were on the right side of the rules, the site continued to defy legal threats that caused other torrent sites, such as Isohunt, to remove links to infringing torrents upon request. As one of the few high-profile survivors, its piece of the file trading pie grew. The site's antagonistic attitude and tangles with copyright holders and rights organisations increased its profile, and the site now claims to be among the top 100 websites in the world. The Pirate Bay's fame became too much for Swedish authorities, and in March 2006 the site's offices were raided by police investigating allegations of copyright violations. Truckloads of file server computers were seized, the site was closed, and three people were held for questioning, including two of the defendants in the court case, Gottfrid Svartholm Warg and Fredrik Neij. Authorities denied that the raid was prompted by urging from the MPA, the international arm of the MPAA, but the Swedish media revealed that the MPA had met with the justice ministry in the months before the raid. The Pirate Bay's site administrators scrambled to get the site back up and running, and with help from volunteers around the world, it was restored within three days. Since the raid, the Pirate Bay has set up a network of servers so that shutting down any one site will only cause the site to go down for minutes. Since then, site administrators have challenged all comers to try to shut them down. "I really want the pleasure of it being down three minutes, then up again," Frederik Neij told Wired. With Sweden's waters becoming less pirate-friendly, the Pirate Bay looked for warmer climes. In January 2007, it reportedly tried to buy Sealand, a platform in the North Sea off the Suffolk coast, which claims national sovereignty. After that fell through, the Bay raised money to buy an island, but the plan was never realised. Some media companies have apparently decided to take matters into their own hands rather than wait for the slow pace of the Swedish courts. In September 2007, hackers leaked six months of internal e-mails from anti-piracy company Media Defender, which revealed that the company was discussing hiring hackers to attack the Pirate Bay's servers. It was the Pirate Bay's turn to go to the courts, and it filed charges against the Swedish arms of Media Defender clients such as Twentieth Century Fox, EMI and Paramount. The charges were not pursued, which also led to protests after the police investigator, Jim Keyzer, took a job for Warner Brothers, a member of the MPAA. 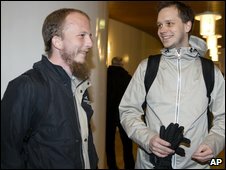 Mr Keyzer is scheduled to be a witness in the Pirate Bay trial. But the Pirate Bay's Robin Hood reputation was sullied in July 2007 when a reporter, posing as a potential advertiser on the site, estimated that the site was earning up to £55,000 per month that was being channelled into a front company in Switzerland. Mr Neij has denied that his team was getting rich from operating the Pirate Bay. "I wish I earned that," he told Vanity Fair. "Do I look like I have, like, $2m?" Gottfrid Svartholm Warg, another defendant, pointed out that they lost $60,000 worth of equipment in the raids. "It's not free to operate a website on this scale," he said. 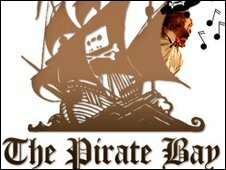 With the Pirate Bay facing its strongest challenge yet, its administrators have not stopped rattling their cutlasses. Mr Warg, in a webcast on Sunday, said: "What are they going to do about it? They have already failed to take down the site once. Let them fail again. "It has a life without us." Mark Mulligan, a digital media analyst at Forrester Research, agreed that even if the Pirate Bay was brought down by the case, the file-sharing genie could not be put back in the bottle. "The industry knows this. But they also know that they need to go through the motions, particularly with the big players. If they don't, that essentially green lights file sharing." He points to previous industry victories against companies like Napster, which shut down the network but didn't reduce the market. "After every victory, file-sharing has got bigger. I see no reason why the same won't happen this time."